San Francisco, CA - The All-Star Reserves were announced yesterday and it was a celebration in the Giants clubhouse. 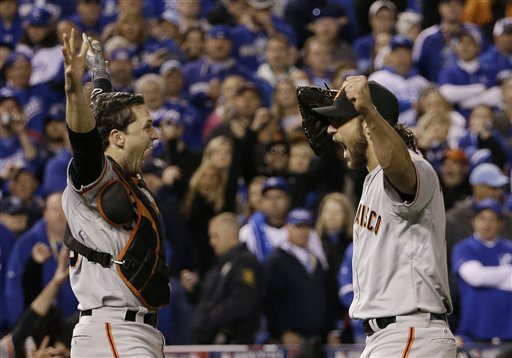 First timers Brandon Crawford and Joe Panik will join All-Star starters Buster Posey and Madison Bumgarner next Tuesday in Cincinnati for the 86th Midsummer Classic at Great American Ball Park. The four players will join their manager Bruce Bochy who will coach his 4th All-Star game. A huge accomplishment for the organization as each of these players came up through their farm system. "I'm really excited," said Panik. "It's pretty cool, we're all Giants from the beginning. We were kind of raised as Giants and have a Giants way about us. It's definitely kinda cool to have all four of us come through the system and all go through the same thing." 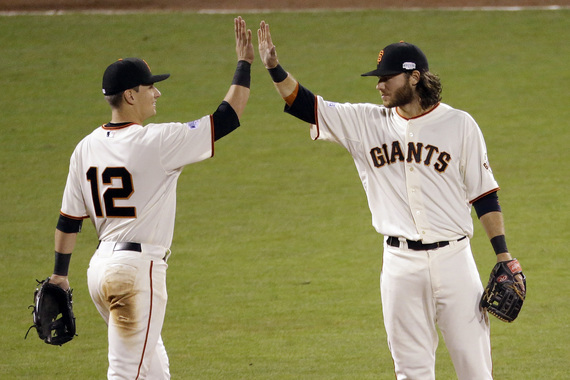 Crawford is the first Giants shortstop to make the All-Star squad since Rich Aurilia in 2001. He leads the National League in home runs (12) and RBI's (49). Crawford was selected by the players, and did not need the help of his manager to add him to the All-Star roster. He's hitting .347 with runners in scoring position and 5-for-his-last-13 in such situations. "I'm excited, it's an honor to be selected to the All-Star team," Crawford said. "I think going into the year you always want to put up numbers that could make you a candidate for an All-Star team. It's a huge honor to be selected by your peers and by the other coaches in the league. To be selected that way is pretty cool." Panik unlike the others has less time in the Majors but has put up remarkable numbers to earn his first spot in the All-Star roster. His 93 hits are the fourth-most in the NL behind Miami's Dee Gordon, Arizona's Paul Goldschmidt and A.J. Pollock. Among NL leaders ranks sixth in doubles (21) and 10th in batting average. Panik's multi-hit games are 11th in the league. It's also the first time the Giants have had a double-play combo in the same All-Star game since 2001, when Jeff Kent and Aurilia made the team. Posey was elected to his third All-Star team, his second as the NL's starting catcher. He received more than 9.9 million votes, beating out Cardinals' catcher Yadier Molina, who finished second in the fan voting. Posey became the Giants first three-time All-Star catcher since Walker Copper in 1946-48. "It's an exciting time and I'm excited to share the experience with Panik, Craw and Bum," said Posey. "Anytime your recognized by the fans or peers it's an honor. I think what has made this team successful is that guys step up on this field and the ultimate goal is to win. This year is special along with 2013 when Bochy and the rest of the staff joined us there. This year's trip will be even more memorable." "My most memorable All-Star was my first in Boston," Giants manger Bruce Bochy said. "Never in a million years did I think I would be managing an All-Star game. I mean your coaching the best players in baseball, it doesn't get any better than that." All deserved to make the trip to Cincinnati, Bumgarner makes his third straight appearance as an All-Star. What he did last season is still very vivid. So it doesn't matter what his numbers are this year, because he's a three time World Series Champion. The World Series MVP wants nothing more than to see the new guys take in the excitement at this years All-Star game. "It's really awesome to get the opportunity to go and be apart of that experience, it's pretty unbelievable," said Bumgarner. "It's going to be a lot of fun, especially to see Panik and Crawford, it's their first one. I'm excited to see that and how they take in everything and be apart of the whole deal."